How do you create an icon in an increasingly crowded category? Work with a product that’s out of this world and distill the brand and package design down to equal parts concept and strategy. And nothing more. Taylor Kennedy’s bean-to-bar chocolate presents a ritual tasting experience in pairs of two very different bars from two very different plantations. 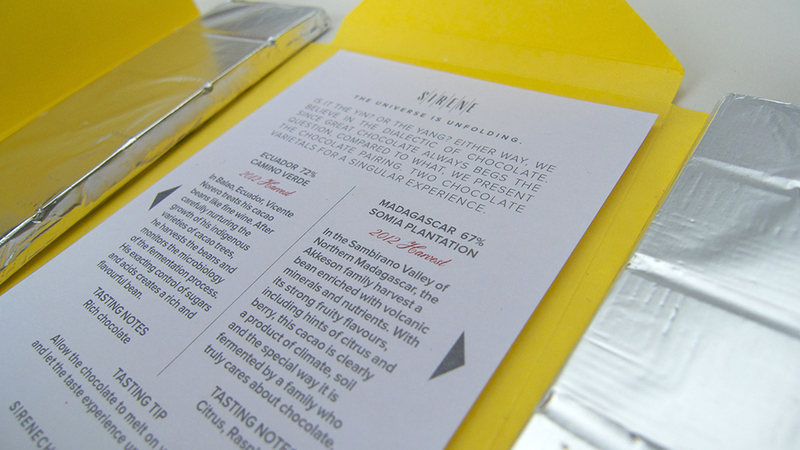 Our design process began with the name SIRENE. The logo maintains the names french and musical connotations and the graphic treatment suggests the tasting experience as one made up of subtle notes that unfold in phases. Our themeline, "The Universe is Unfolding", ties the concept to the varied geographic origins of cacao and the unique packaging, designed around a dramatic unfolding and reveal of the product. The promotion program for SIRENE was an education in the science of terroir, fermentation and other aspects in the growing category of bean to bar chocolate. We developed a voice for the brand to bring the chemistry 101 content to life. After a successful two years in the marketplace, distribution for Sirene has grown exponentially across North America and Europe. The little yellow box is now popping up in all the right places. After all, it's hard to miss.